Whether it's the Barre Bombers, the Vermont Bicycle Shop Adventure Club, or The Millstone Trails Association, there are lots of folks who put adventures together, this is where you can get invited on any number of those adventures. We've teamed up again this year with the Millstone Trails Association weekly mountain bike ride. 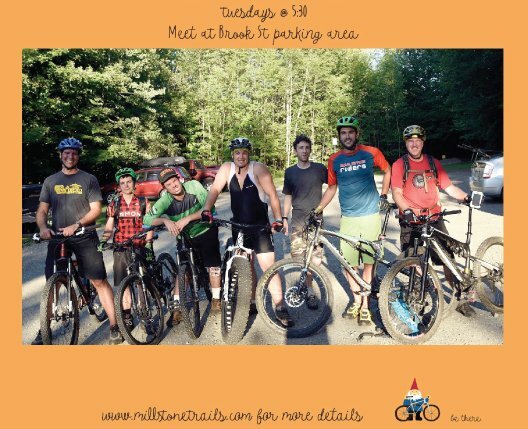 Every Tuesday (except for a couple of holidays) meet at the Town Forrest Parking lot in Websterville for a fun all comers welcome mountain bike ride. Helmets and a mountain bike in good working order are required. A proper night riding light and a flat repair kit are also highly recommended. Check out the Millstone Trails website and their Trail Hub page for more information!